The prize for October is one of my Edinburgh Mugs. Available in Victoria Street, Leith or Edinburgh Castle they are perfect for a Monday morning cuppa! Can’t wait? Buy an ES mug right now online HERE. #WhereArtI 1st October answer: This is the Victoria Park House Hotel on Ferry Road. Caitlin H was randomly picked to go into this months draw for an Edinburgh Sketcher mug. More next Monday! Oops, just realised I forgot to put this in yesterday – and after all that effort finding it too! It’s Victoria Park hotel, apparently noted for wakes and other cheery stuff. 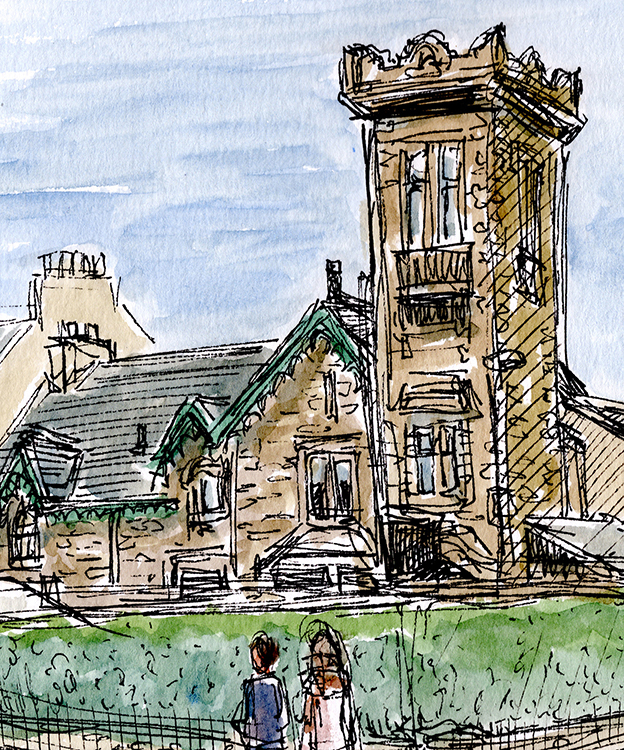 It is of Victoria Park House Hotel and I suspect you were across the road at the wrought-iron gate to Victoria Park when sketching it.